This part will add doors leading a level to another and a logic for adding/moving the PC object in the correct place on the scene. New functionality that I intent to introduce require adding logic to the PC. Lets start that by creating minimal implement of the CharacterInterface. First, I add features I need to implement doors leading from a level to another. I set-up door object so that each door has a spawn point attached to each other (see figure below) and that door is in two levels: one side in one and the other side in the other. 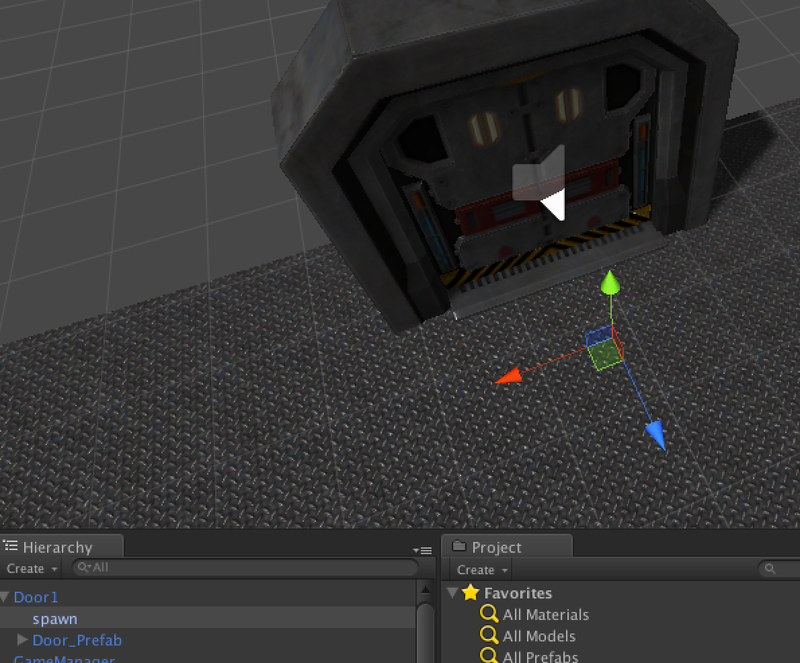 (I am using scifi door from Unity assets store by 3DMondra as model in the image). // if we did not come via door, we use object with tag PlayerStartPosition. // now lets place and orient the PC based on the found start position object. As you noticed, I do not want to place the PC directly in the scenes by place PC based on doors used to come to the level or StartPositon objects. For this we need to have a manager that instantiate the PC when needed. Lets create empty GameObject and call it GameManager. I create GameAgents script that handles instantiating the PC using prefab. GameAgent is singleton. That means that there can be only one instance of the script in the scene. Multiple instances will lead problems. Door does not work yet. We need to add Collider in trigger mode to it, add script that catches the trigger event and knows what level should be loaded. Door should also have an AudioSource component that has a sound file attached that can be played when the door is used. // Display that the door is locked. Now we need to have two levels, lets say level_start and level1. Both levels should also have an empty GameObject tagged as PlayerStartPoint so that the PC gets spawned somewhere before doors have been used first time (or the level does not have a correct door, like when hitting play in some level). Figure below shows a door setup for a door that have two randomly selected alternatives where the door can lead. Door setup. Two possible different end points in level1. There are selected randomly (but are persistent within one play-through). Note that this example will create non-functioning one door to level1. The correct use would be only one door counter-part in one level. Note that when a door have multiple DoorLinks, the doors in different levels needs to have the same name. Otherwise the door might not lead back to the same place (even if the door is otherwise correctly configured).